With the bases loaded and two outs, Tristin English walked up to the plate. The Chatham Anglers held a one-run lead over the Harwich Mariners on July 3 in the sixth inning. English — hitting in the three-hole and playing right field— was 0-for-2 on the day, but had hit three home runs and three doubles in the last week. The first pitch English saw — a changeup down and in — he chopped foul. The second pitch never returned to Whitehouse Field. Tom Sutera (Siena) threw English a hanging breaking ball and the right-handed slugger did not miss. The Georgia Tech product sent the ball flying into the woods beyond the wall in left field for a grand slam. The moment is English’s favorite of the summer. “You don’t hit grand slams very often in this game,” English said. For the rising redshirt junior — who was recruited as a catcher, drafted as a pitcher, plays first base at school and is recently removed from two elbow surgeries — to be a right fielder hitting round-trippers in the best summer league in the country is probably not what most people would have pegged him to be doing in 2018. But English has dealt with all the challenges thrown his way and thrived. When English committed to Georgia Tech, it was as a catcher. However, English hated catching. He played the position since elementary school and had grown sick of it. So when the chance came to pitch, he took the opportunity and proved to be even better on the mound than behind the plate. English came into his freshman year primarily expecting to pitch, but bone spurs in his elbow forced him to hold out from pitching for the season. So, the coaching staff asked if he could play first base. Despite playing only one or two games at the spot before the 2016, English thrived at the position. He started 52 games at first, hitting .315 with a Georgia Tech-rookie record of 21 doubles. He was even named First Team All-ACC as a first baseman over Virginia's Pavin Smith. Smith — who would later be the eighth overall pick in the 2017 MLB Draft — let English know one day that he was not happy about the choice. English had surgery for the bone spurs after his freshman season. The recovery period lasted through the fall and into the winter. By January of 2017, English was close to being cleared. The right-hander was throwing his second-to-last bullpen before he was set to be officially cleared. For the first 72 pitches of the 75-pitch session, English was feeling strong. Pitch 73 was different. He immediately knew something was up but continued with his final two pitches. The first pitch hit the top of the net in the bullpen. The second did the same. English walked off the mound. His coaches asked him if he felt any pain. English went for an MRI before trying to throw his last bullpen, but he could not even make it onto the mound. During warmups, English — despite putting all the energy he could into each throw — could not fling the ball 90 feet. The MRI on his elbow came back clean as no ligament tears were found in the elbow. English went to visit the renowned Dr. James Andrews, who decided that Tommy John surgery would be the best option. Andrews said it was the first time he had ever seen a tear like English’s. The tear was horizontal. MRI’s only show vertical tears, which is why nothing showed up on the the scan. Because the tear was never discovered with an MRI, it is unknown how long English had a tear in the ligament. It was possible he had a partial tear since high school. Before his two elbow surgeries, the last game English played in a Georgia Tech uniform was on June 5, 2016. It was in the final of the Gainesville Regional, where Florida defeated the Yellow Jackets, 10-1, on its way to Omaha. It was February 17, 2018 — 623 days after that loss to Florida — when English played again for Georgia Tech. Against Minnesota, English made the start at first base while hitting in the cleanup spot. In his first plate appearance, he was hit by a pitch. After a double and a groundout, English crossed home plate for Georgia Tech’s first run of the season and the first run in an eventual 3-2 victory over the Golden Gophers. 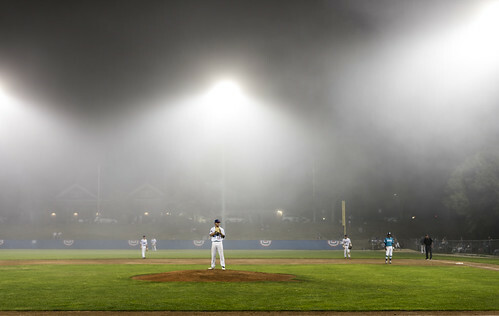 The next day against Bradley, English not only hit his first home run since surgery — a third-inning, two-run shot over the Russ Chandler Stadium wall in right field — but also pitched for the first time in his college career. His return to the ballfield was a successful one. English was named a Midseason All-American by Perfect Game/Rawlings and D1Baseball and was again named First Team All-ACC at the end of the season. His success has translated to the CCBL as well. The Georgia native is hitting .289 with five home runs, five doubles and 18 RBIs while pitching in three games with opponents hitting .269 off him. English was selected as the starting designated hitter for the East Division in the All-Star Game, where he notched two hits and scored a run. On the Cape, English has not just played his customary college positions — first base, designated hitter and pitcher. He has also appeared in left and right field while also taking ground balls at third base before a game. This willingness to play all over the field was something that stuck out and impressed Holliday during the first meeting between the two. 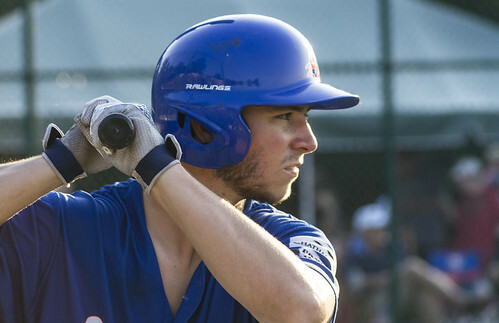 Because English is draft-eligible and was not taken in the 2018 MLB Draft, he can be signed as an undrafted free agent like former Chatham pitcher Troy Miller (‘18), who just signed as a free agent with the Toronto Blue Jays on Wednesday. He has heard from multiple teams over the summer — including the Arizona Diamondbacks and Cincinnati Reds — who are willing to offer him a sizeable bonus to sign as an undrafted free agent. However, the offers do not match English’s self-selected number. This is not the first time English has had to deal with MLB teams wanting his services. Out of high school, the Cleveland Indians drafted English in the 39th round of the 2015 MLB Draft. He was looking for a $1.5 million signing bonus. A team offered him $1.1 million in earlier. English did not accept. “Looking back on it, I was like ‘Damn, that’s a lot of money,’” English said. “That’s why you come up with a number. You don’t want to come up with a number and then start rethinking your number for no reason." One of the reasons English does not acquiesce on his numbers — both in 2015 and now — is his education at Georgia Tech. English is studying supply-chain management in the Scheller College of Business at Georgia Tech. He knows how crucial it is to have something to fall back on if baseball does not work out and the education at Georgia Tech will set him up for a successful life after baseball. “Getting a degree from Georgia Tech is something nice to fall back on,” English said. “A top-15 business school in the country is a pretty good degree to get for free. But English’s near future is still in the game of baseball. English says he does not have a preference to what position he plays at the next level. If the team that drafts him wants to him to pitch, then he will pitch. If the team that drafts him wants him to hit, then he will hit. Either way, the Georgia native said he could make the majors with the bat or the arm as the main attraction. In a few years, you may see English straddling the rubber and showcasing his mid-90s fastball or holding on a runner at first base. Or he will be playing somewhere different. Like the two-way star told Holliday in June, he is willing to play anywhere. Because, above all, English is not just a pitcher or just a hitter. Tristin English is a baseball player.